“You got any more secret stuff? l think it’s starting to wear off”. “lt didn’t wear off. lt was water”. “You guys had the ”special stuff” inside you all along”. The 1996 epic that was Space Jam did a few things for me. It made me be obsessed with the Chicago Bulls from the age of 6 – 9, blew my mind with how the Looney Tunes could enter real life and how, if you really believe, you can stretch your arm across a basketball court to win an Intergalactic grudge match with a slam dunk. It also taught me a bit about motivation. 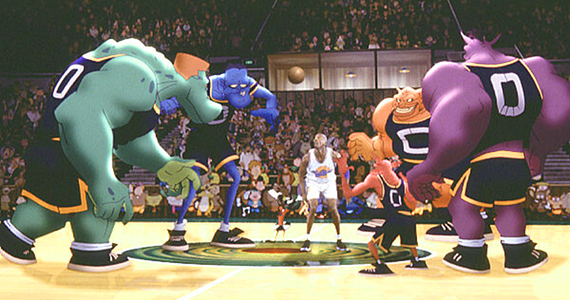 In the scene where Bugs Bunny sees that his team mates are under performing due to a lack of charisma, he creates ‘Michael Jordan’s Secret Stuff’. The placebo effect takes hold and they start winning. I’m not saying you should lie to your team to motivate them, for example, “Hey Cassandra, wear these magic pants and your sales will go through the roof!” I have a feeling that would be immoral for a number of reasons. What I’m saying is be creative with your motivational tactics. You see that all-you-can-eat down the road, create a friendly competition among peers to see who can eat the most. You see that discount on personalised baseball caps, get everyone in your team one with their name on it. Work doesn’t have to be a place of misery, it’s up to you to make it fun and positivity leads to productivity. Remember, “You guys had the ”special stuff” inside you all along”.